Winter can bring frigid temperatures, snow storms, freezing rain, ice, and snow. Even during rough weather, it’s business as usual for us and we’re prepared to get you where you need to be safely while keeping you in the know. Storing our trains near Union Station so they don’t have to travel through as much snow for the afternoon commute. Keeping our trains at a certain temperature when not in use to make start-up easier on cold mornings and working hard to keep train doors de-iced. Adding more fans that blow hot air onto switches to prevent them from freezing. Using high-pressure snow-blower trucks to remove snow from tracks. One late train delayed by just a few minutes can impact dozens of other trains. That means minor delays caused by winter weather can have a major impact on our service. When there is severe winter weather, we keep some GO stations open late to provide a warm place for you to wait for your bus or ride home. We also work around the clock to clear our parking lots, sidewalks, and platforms of ice and snow to ensure your trip is a safe one. Many stations and stops have heated shelters to keep you warm while you wait. Check the Service Updates page for up-to-date service information. Sign up for On the GO alerts to receive updates about your trip. Stay tuned to CP24, 680News, and other local news outlets for service and weather updates. Be careful on stairs and platforms, in our parking lots, and when you get on and off of trains and buses as surfaces may be slippery. Allow extra time for your trip or consider taking an earlier one. In cases of severe winter weather, we run on a special schedule. Express trains will instead make all stops, and some trips may be cancelled and replaced by others with earlier or later departure times. There may also be changes to bus trips that connect to trains. 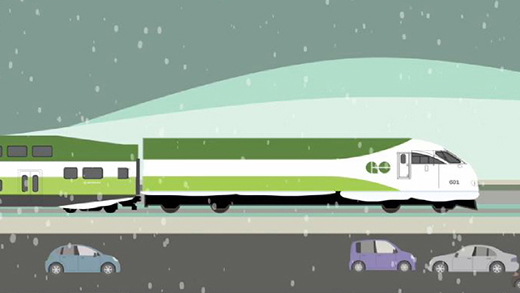 Delays caused by extreme weather are not eligible for the GO Train Service Guarantee.